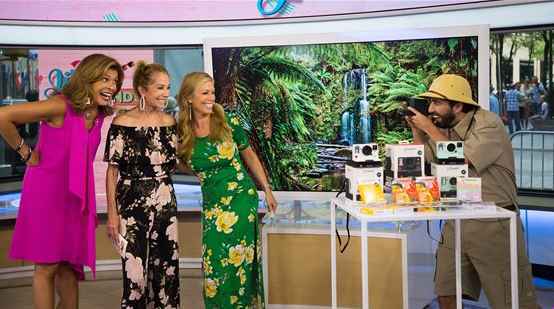 Today Show brings you the Kathie Lee and Hoda Jill’s Fun Finds Sweepstakes where they will be giving you an opportunity to win one of Jill Martin’s Fun Finds such as A retro pool float, smart TV and other exciting prizes. Prizes: There will be fifteen (15) prizes awarded (“Prizes”, each a “Prize”), one (1) Prize to each Winner. Three (3) Winners will receive Prize 1 (“Prize 1”). Prize 1 will consist of one Tillow. ERV of Prize 1 is twenty nine dollars and ninety nine cents ($29.99). Three (3) Winners will receive Prize 2 (“Prize 2”). Prize 2 will consist of HIDRATE SPARK 2.0. ERV of Prize 2 is fifty four dollars and ninety five cents ($ 54.95). Three (3) Winners will receive Prize 3 (“Prize 3”). Prize 3 will consist of a ROKU Smart TV. ERV of Prize 3 is five hundred and ninety nine dollars and ninety nine cents ($599.99). Three (3) Winners will receive Prize 4 (“Prize 4”). Prize 4 will consist of one FUN BOY retro pink convertible float. Estimated Retail Value (“ERV”) of Prize 4 is one hundred and twenty eight dollars ($128.00). Three (3) Winners will receive Prize 5 (“Prize 5”). Prize 5 will consist of POLAROID ONE STEP 2 ANALOG INSTANT CAMERA. ERV of Prize 5 is one hundred and twenty nine dollars and ninety nine cents ($129.99). Who Can Enter: The Jill’s Fun Finds Sweepstakes is open only to legal residents of the forty-eight (48) continental United States and District of Columbia who are eighteen (18) years of age or older at the time they enter the sweepstakes. When To Enter: The Kathie Lee and Hoda Jill’s Fun Finds Sweepstakes entry begin on July 17, 2018 at 10:30 AM EST and end on July 24, 2018 at 5:00 PM ES. Who’s Sponsor: The Kathie Lee and Hoda Giveaway is sponsored by NBCUniversal, TODAY Jill’s Fun Finds Sweepstakes, 30 Rockefeller Plaza, New York, NY 10112.